Ticket Types are a core feature of TeamSupport and allow you to classify tickets in a structured manner. The system provides complete flexibility in how you configure ticket types, and we also let you define different custom fields for each ticket types. What Ticket Types should I have? When building your Ticket Type list, you should think of what types of questions your customers have. If your business is a software company, you may have Support, Bug, and Feature Request questions from your customer. If your business is in manufacturing, you may have Hardware or Software questions, or may need to manage RMA’s. A service industry may have questions relating to Billing, Complaints, and Orders. You should limit your Ticket Types to 8-10, otherwise your agents may have a hard time deciphering which Ticket Type is best for their incident. Custom Fields: Custom Fields are another major part of customizing your workflow in TeamSupport. Custom fields are based on your Ticket Types. You may want to consider this when building your Ticket Types. For example, if there is a certain project that requires unique data to be collected, you may want to separate this into it’s own Ticket Type so that it can have it’s discrete list of Custom Fields. Similarly, if you have several different types of questions that end up sharing Custom Fields, you might consider combining those into one Ticket Type. Ticket Automation: You can automatically change Ticket Types using Ticket Automation. Reporting: It is likely that you will setup many reports against your Ticket Types because they will be so core to your business. There are default reports in your account based on Ticket Type, or you may create your own reports. Default settings: When you first log into a TeamSupport trial account there will be a handful of Ticket Types pre-configured to help you get started. It’s important to understand that these pre-configured Ticket Types can be changed to whatever you want. 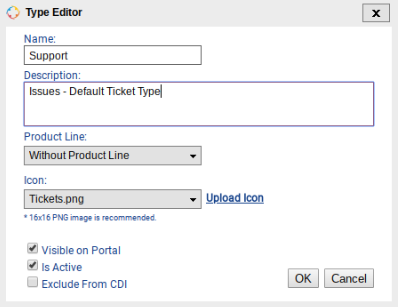 Product Lines: TeamSupport customers with Enterprise Edition can associate Ticket Types to Product Lines. This means Ticket Types with an associated Product Line will will only appear as on option on tickets within the app if the Product Line has been associated. Optionally, Ticket Types can be filtered on the Customer Hub based on the Product Line association as well. This option is configured in the Basic Hub Settings Tab. From the System Property Type pull down, select Ticket Types. Here you can Edit (pencil icon), Delete (trashcan icon) and re-order (up and down green arrows) how your ticket types appear. !Tickets created via email or the Customer Hub will default to the FIRST ticket type you have defined. You can change which ticket type is created by these methods just by changing the order of the ticket types in the above menu and putting the one you want to be the default at the top. To Add a new ticket type, click the “+ Add” link. Description: This is a longer description of the Ticket Type. This will only be made available internally. Product Line: TeamSupport offers a feature called Product Lines, which allows you to group your Products together. One feature of Product Lines is the ability to filter your Ticket Types based on Product selection on a ticket. In order for this to work, you must first setup your Products within your Product Lines. Next, create your Ticket Types and assign a Product Line. When a Product is selected on a ticket, the Ticket Types that match the Product Lines will be available for selection. Optionally, Ticket Types can be filtered on the Customer Hub based on the Product Line association. This option is configured in the Basic Hub Settings Tab. Icon: This icon will be displayed internally within TeamSupport for your Support representatives. We have included a few defaults but feel free to upload your own icons. 16×16 is the standard size for these icons. Visible On Portal: The Visible On Portal option allows your customers to choose which type of ticket they want to submit. This is optional, and if you don’t have the ticket type visible on the Customer Hub, new tickets created via the Customer Hub will default to the first ticket type. Is Active: Default: Unchecked. At times you may wish to retire a Ticket Type that you no longer need. The “Is Active” checkbox allows you to mark a Ticket Type as no longer being active. If a Ticket Type was previously active, and then you uncheck this box, the Ticket Type will no longer be available throughout the system. It will remain on Tickets that already had this selection for historical purposes. Exclude from CDI: TeamSupport’s Customer Distress Index (CDI), captures information about your Customers and calculates a “score” to indicate their satisfaction level. By checking this box, tickets in this Ticket Type will be excluded from the CDI calculation. This may be necessary for Ticket Types that are not related to the satisfaction of your Customers, or skew the metrics (i.e. automatically generated tickets, internal tickets).